The annual Consumer Electronics Show in Las Vegas always whips up a frenzy among tech enthusiasts with reporters hammering away to bring us news of the hottest new products from the biggest tech show of the year. All the big hitters were out in force to show off their new products, we had smart phones, tablets and super HD 4K TVs with smart operating systems being unveiled, as well as the best in new wearable tech. CES has also now become a major staging ground for the auto industry with Mercedes, Audi and BMW unveiling new cars and in-car technology. We analysed all the Twitter conversations around the CES2015 hashtag to cut through all the buzz to tell you which Influencers are really driving the conversation. What brands attract the most attention on social media? At Onalytica we have analysed all the #CES2015 discussions by looking at over 350,000 tweets to present you the most influential individuals and brands that drive the discussion. Be sure to click the green button above to see this beautiful network map in full detail! 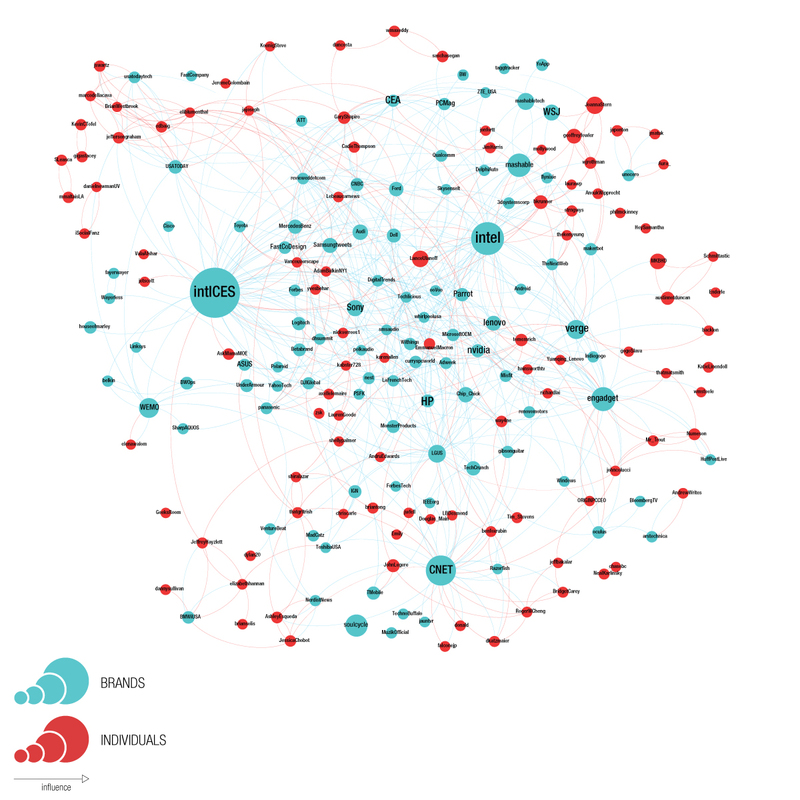 We looked at all the individuals engaging in #CES2015 discussion including journalists, academics, reporters, editors, and CEOs to give you the Top 50 influencers in the CES 2015 landscape. Be sure to hit one of the green buttons to download (free!) the full top 100 brands and individuals, including detailed pie graphs on the hottest brands and products. We also looked at all the key players driving the discussions in the tech community including classic publications like CNET and Mashable as well as big brands like Sony & Samsung. It’s interesting to note the emergence of car manufacturers like Audi, Mercedes-Benz and Ford this year. 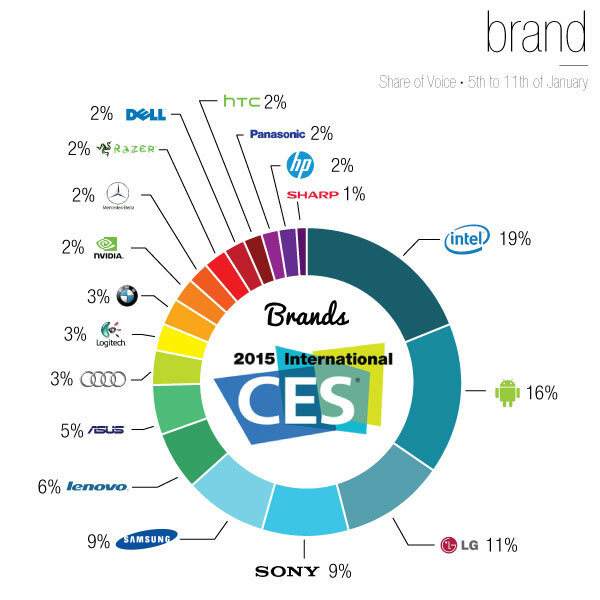 So here it is the Top 50 brands at #CES2015. 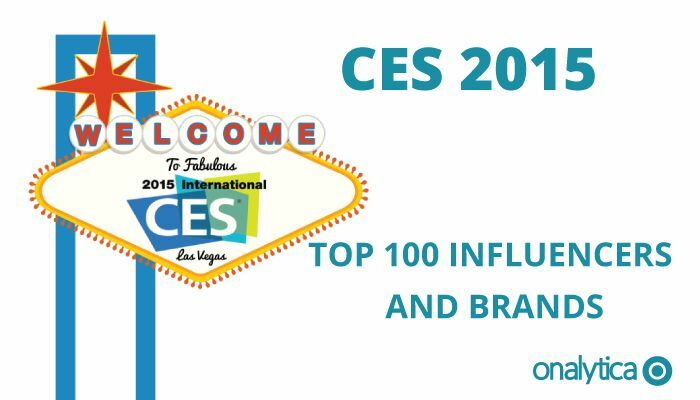 Be sure to download the full analysis with the top 100 most influential individuals and brands at CES 2015! At Onalytica we love building these lists and want to give back to our loyal readers as much as we can. If you’re interested in other topics (such as Content Marketing , Wearables, Machine to Machine …) be sure to have a gander on our blog or why not propose some topics to us on twitter? We also build some very cool software to manage all of these influencers and you can get a free demo at any time by clicking the button below.